On May 27,2010, Chinese and Indian presidents agreed that the two Asian countries should further develop partnership and cooperation for mutual benefits as well as regional and global peace and development. 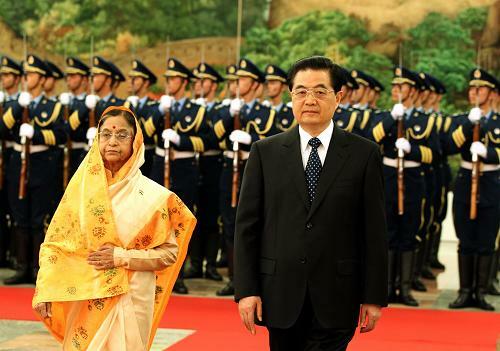 Chinese President Hu Jintao and his Indian counterpart Pratibha Devisingh Patil held talks in Beijing Thursday afternoon. Patil arrived in Beijing Wednesday for a six-day state visit to China, the first of its kind over the past decade. Hu said expanding the strategic partnership of cooperation between China and India conformed with fundamental interests of both countries and their people and was conducive to peace, stability and development of the region and the world. He said leaders of the two countries should have frequent meetings and negotiation to enhance mutual trust, for which governments, legislatures and political parties should also play a role. President Patil said India-China relations were of global and strategic significance, and all political parties in India were supportive of further advancing such relations. On trade and economic cooperation, Hu urged the two countries to push forward cooperation in fields including finance, agriculture, science, technology, forest and environmental protection. The two countries should create a more flexible environment for each other's companies to make investment and undertake construction contracts, he said. Both countries must adhere to the principles of openness and mutual benefit while opposing protectionism in any form, he said. Describing trade and economic cooperation as a pillar of bilateral ties, Patil said India and China should work together to realize trade target that had been set. Hu said China and India should work more closely to address global issues such as economic downturn, climate change, energy security and food security. The two countries should maintain close communication and coordination within multilateral mechanisms such as China-Russia-India, BRIC, BASIC, and G20, in a bid to increase the voice of developing countries, Hu said. Patil said India was ready to strengthen cooperation with China to address the global issues and safeguard the interests of developing countries. Both presidents agreed that the two neighbors should step up people-to-people exchanges in the areas of culture, education, media, youth and non-government sectors. Celebrations such as "China Festival" in India and "India Festival" in China would be held this year to mark the 60th anniversary of the establishment of diplomatic relations. After the talks, the presidents witnessed the signing of a number of cooperative documents in the areas of tourism, human resources and sports. President Patil also met with top Chinese legislator Wu Bangguo and Premier Wen Jiabao Thursday. Besides Beijing, she will visit Luoyang City in central China's Henan Province and will attend the 2010 World Expo in Shanghai.